NobleSeal TS is a single sheet membrane that provides waterproofing and crack isolation/joint bridging for thin-set installations of ceramic and stone tile. To be used with NobleFlex Drain Flashing and NobleSeal TS Membrane. 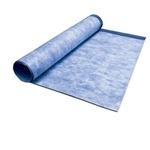 Provides smooth transition of thin-set waterproofing sheet membrane to a clamping ring drain. Ideal for NobleSeal thin-set (thin bed) waterproofing membranes or full mortar bed membranes when the drain is set too low. Noble ValueSeal is Noble's NEWEST, ultra-thin, cost-effective sheet membrane for interior waterproofing of floors and walls. Noble Chloraloy is a premium liner for waterproofing your shower. Unlike standard PVC liners, chloraloy is guaranteed to last a lifetime. 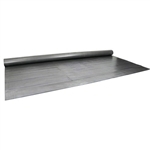 It is designed to be used under full mortar bed installations of tile and stone. Noble NobleSeal SIS reduces floor to floor impact noise created by walking, tapping, etc. on hard surface flooring like tile and hardwood floors.